Before MST3K there was … The Texas 27 Film Vault! In the middle 1980’s, way down on Level 31 Randy Clower and Richard Malmos, machine-gun toting Film Vault Technicians First Class hosted this neglected cult show. Balladeer’s Blog continues its celebration of the program’s THIRTIETH anniversary year. Welcome to a special Frontierado Season look at this neglected cult show! And remember, Frontierado is Friday August 7th! ORIGINAL BROADCAST DATE: Saturday May 18th, 1985 from 10:30pm to 1:00am. 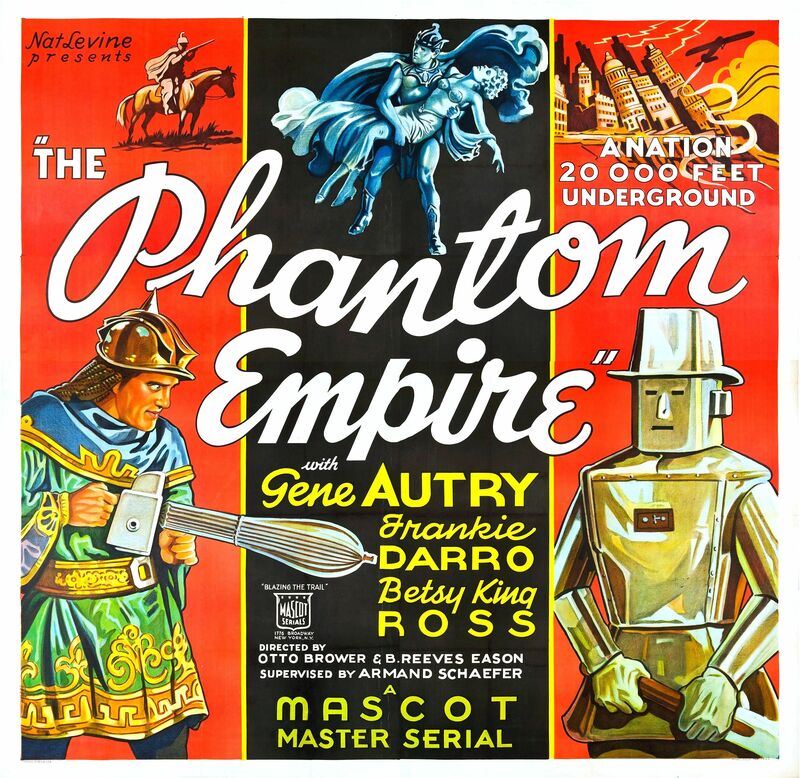 SERIAL: Before showing and mocking Billy the Kid vs Dracula our members of the Film Vault Corps (“the few, the proud, the sarcastic”) showed and mocked an episode of the Mascot Serial The Phantom Empire (1935). FILM VAULT LORE: Special thanks to my fellow Vaultie “King Vita” for the date of this episode. He also passed along the info that he was already obsessed with western movies, serials and television shows by this point in the 1980’s. The King recalls that he got all excited because he assumed the coincidental “all-western” theme of this episode of The Texas 27 Film Vault, along with the “Texas” part of the title, meant that every episode would focus exclusively on westerns. (Ken Miller’s recurring character Tex probably added to his mistaken impression.) Needless to say he learned he was wrong by the following episode but still fell in love with the show. A behind the scenes photo of Laurie Savino, who held the rank of Mystery Clip Technician in the Film Vault Corps. 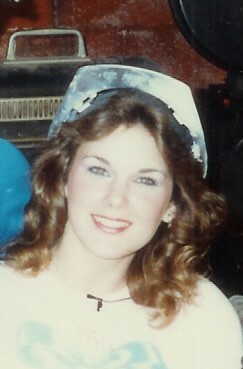 FILM VAULT CORPS: Here is another photo of Laurie Savino, whose rank in the fictional Film Vault Corps was “Mystery Clip Technician” for the trivia contests based on quick clips of movies previously shown by Randy and Richard. Sometimes the prizes would be movie ticket give-aways sponsored by Channel 27 and other times would be items like the Randy and Richard action figures. Laurie was also featured on The Texas 27 Film Vault 3-D poster (another of the give-aways) and the occassional newspaper article about the program. 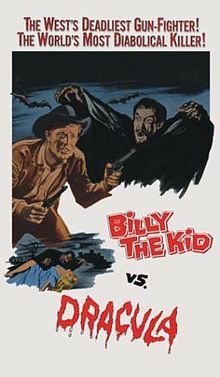 THE MOVIE: Billy the Kid vs Dracula is one of the most notorious Golden Turkeys of all time and was directed by the legendary William “One Shot” Beaudine. Beaudine got his nickname for his commitment to using just one take for each scene, no matter how good or bad. And by this point in his career – which reached back to the days of silent movies – there were a lot more bad takes than good. 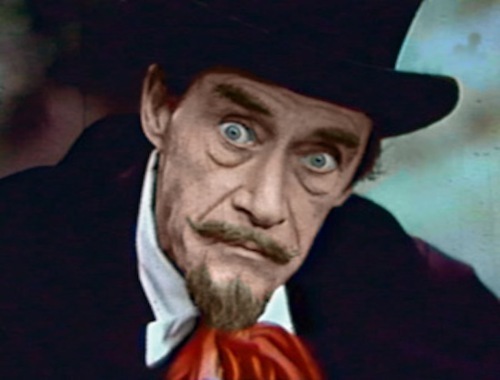 The star of Billy the Kid vs Dracula was John “He’s probably even in the Zapruder Film if you look hard enough” Carradine. As Dracula, Carradine bugs out his eyes, mugs to the camera and twists his face into so many goofy expressions it makes his performance in VooDoo Man seem dignified and reserved. Carradine’s TRUE co-star in this movie is not the stiff playing Billy the Kid (Chuck Courtney), but rather the virtually non-stop day-for-night shooting that was typical of so many bad movies but which took center stage in this film. I don’t care which other movies you want to talk about THIS ONE easily eclipses those (see what I did there) in terms of the sheer amount of screen time featuring a nice sunny day while the characters talk about it being nighttime. Melinda Plowman plays Betty Bentley, Billy the Kid’s true love and the motive behind the sudden abandonment of his criminal career. Dracula gets the hots for her when he sees a photo of her as he shares a stagecoach with her mother and distant uncle. Drac kills Mom and Uncle James, then assumes the uncle’s identity to get close to Betty. Drac never drinks … whiskey. Virginia Christine, remembered by most Americans as “the Folger’s Coffee Lady”, portrays a European immigrant whose superstitious familiarity with vampire lore is at first scoffed at by the other cast members, but then proves crucial to saving the day. Harry Carey, Jr is along for the ride as Ben Dooley and is kept company by Bing Russell, who plays the movie’s secondary villain Dan Thorpe. 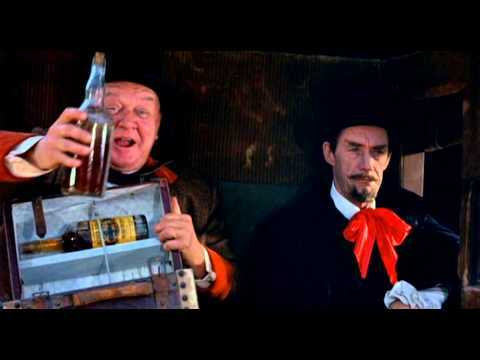 Throw in an alleged Indian Tribe that look even more caucasian than the Hekawi Tribe from F-Troop, a very cheap bat prop for Dracula’s transformations and the legendary scene where Drac gets pumped full of bullets to no effect but is then knocked out cold when Billy the Kid THROWS the empty six-shooter at him. Classic! Dude u find the obscurest things and shows around. 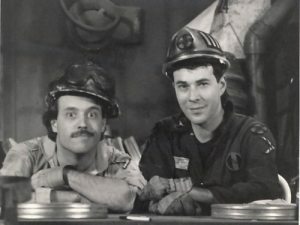 Without your blog I think this show would have been forgotten by now. Maybe so. Who knows? Thanks, though. That’s a great review. That show seems interesting.